One of Lisbon’s major landmarks is the Mosteiro dos Jerónimos, a massive 16th century monastery that serves as a monument to Portugal’s success during the Age of Discovery. The size and sturdiness of the building (one of the few in Lisbon to survive the devastating 1755 earthquake) and the richness and detail of the interior and furnishings testifies to the wealth generated by the Portuguese voyages, conquests, and trade. The variety of styles testifies to the multitude of regions where the explorers landed. I joined Sandra and her family on the day they arrived in Lisbon (note that this blog is not in chronological order) for a tour of the monastery. She looked great, despite having to get up at four in the morning to catch her flight. She’s the one with the guidebook. I’m the one with the crooked glasses. 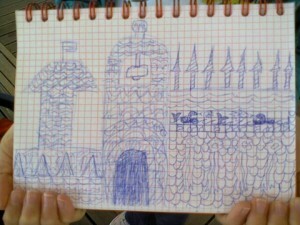 Her 11-year-old daughter, Olivia, loves to draw and created her own version of the monastery. 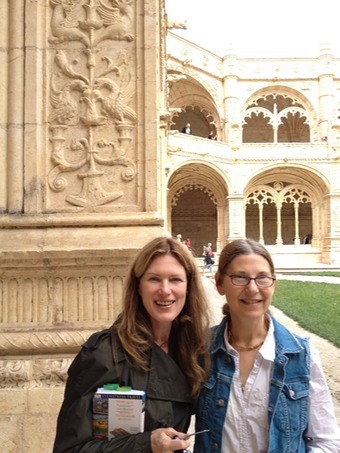 The other four had to drag me out of the room with the exhibit that traced the history of Portugal, the history of the monastery, and the history of the world from the 15th century to the turn of the 21st century. The overview was thorough and fascinating, and it led me to want to learn more, which these kinds of exhibits are supposed to do. I took pictures of the part of the exhibit that was most relevant to my teaching–the Inquisition and the Portuguese conquest of Recife, Brazil from the Dutch, which led the city’s small Jewish community to flee to New Amsterdam (now New York) and form what would become the first Jewish settlement in the present-day United States. I also read about the 1755 earthquake and saw drawings of the disaster, which took place on All Saints’ Day when many candles were lit that unfortunately set multiple large fires amid the wreckage. After the monastery, we went to a tropical botanical garden, where Olivia defied an angry male peacock to get a photo of the hen and chicks. I’m still waiting for the picture, but I can testify to the fact that Olivia survived her own “age of discovery” unscathed.